It has been said that the heart of a good fountain pen is the nib. Indeed, it is the nib which gives our writing character and flourish. 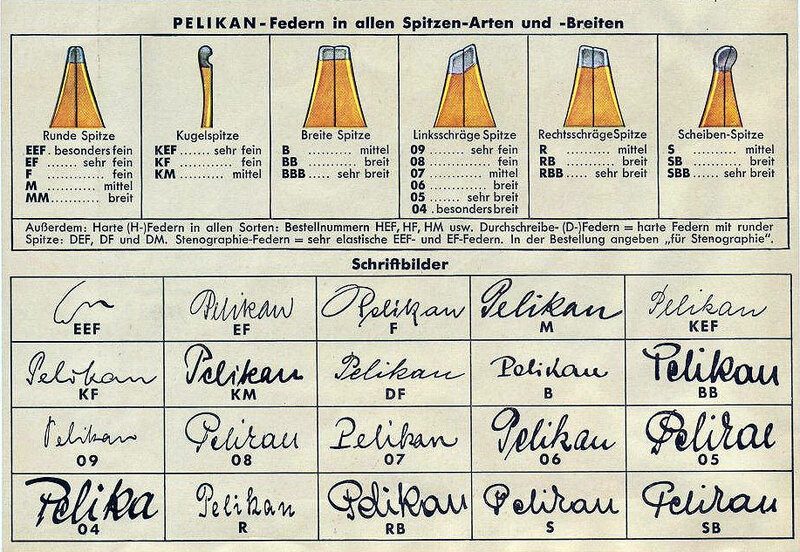 During the height of Pelikan’s vintage pen manufacturing there was a plethora of nib varieties available for purchase. A vintage advertisement lists 23 different nib sizes available at one point. Over time, these options have slowly been reduced based on various manufacturing and market influences. In modern times, we still had double and triple broads available to us as well as obliques. Sadly, these too were discontinued in late 2012 leaving us with just EF, F, M, and B as the standard nibs available across most of Pelikan’s lines. This unadventurous selection is at least dependable if not inspired. There have been flashes of inspiration seen with the introduction of the italic broad nib for the M8xx line in 2010 as well as the italic nib option which was more of an italic medium that has graced several of the M2xx releases. Many, myself included, lament the lack of variety in Pelikan’s nibs today. If you’re looking for a little diversity, a few limited options have recently come to light. The first development to review is the unexpected availability of double broad nibs courtesy of Niche Pens from the UK. Like many of us, they wished to see the manufacture of at least the BB sized nib continued and passed that feedback onto Pelikan. The company subsequently offered to make a batch of M800 and M805 nibs available via a bulk purchase, a deal to which Niche Pens agreed. Consequently, they now offer BB nibs for sale individually or as an option when purchasing an M800 or M805 pen. You may also be able to find other vendors with similar stock as the distributor may have ordered additional units to make available to other merchants. These large nibs make for an excellent starting point for custom italic grinds. Fritz Schimpf is a long standing and well known retailer of fountain pens in Germany. They are celebrating their 135th anniversary this year. To commemorate the occasion, they are offering the Fritzfeder 135 nib for the Pelikan Souverän M800 and M805 fountain pens. These are italic nibs with a 1.35mm broad down stroke and a 0.7-0.8mm thin cross stroke. 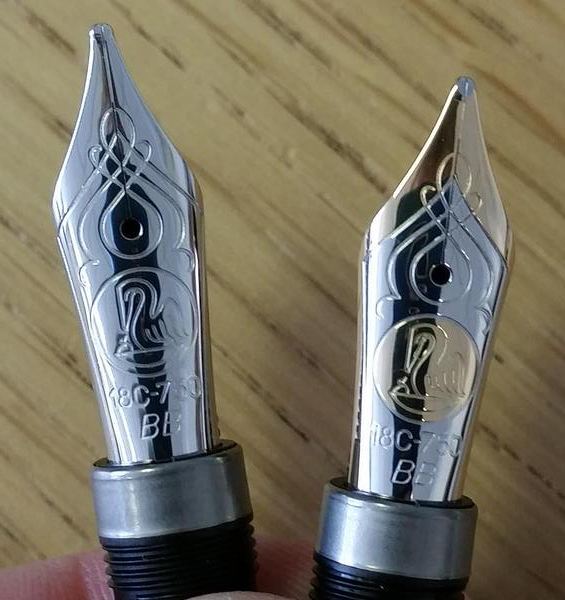 Like the BB nibs above, these will be offered in both two-tone (M800) and rhodium plated (M805) finishes. This is a very limited run of just 12 pieces divided amongst five two-toned and seven rhodium plated nibs. The nib has an “S” engraved on it which is seen on Pelikan’s ‘Make a Wish’ nib. These appear to only be available with a pen purchase and will start shipping sometime in mid-October with pre-orders being accepted now. The price of a Fritzfeder 135 equipped pen will command a significant premium over the more standard nib sizes. Follow the links below to see a writing sample from this nib. Beautiful, but beyond my meager pension budget. Yes, variety does not come cheaply. Its sad that a firm that has a long history is now so limited in its nib selection. I have to resort to hunting the 2nd hand market for very broad nibs. That’s true but this phenomenon is certainly not limited to Pelikan. Thankfully there is a robust second hand market. 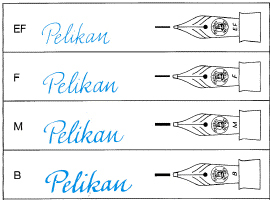 As soon as I heard in 2012 that Pelikan was narrowing their nib offerings I purchased everything my favorite nib-meister had in stock that was going to be discontinued. He went home from the show very happy and I went home broke. Isn’t that one of the great things about our beloved Pelikan, the nib assembly? I have a collection of a couple hundred Parkers – have you ever tried to clean them thoroughly? Have you ever wanted to switch from that O3B to your left foot oblique crisp italic? Easy on my Pelikans. And I might add that Niche Pens prices are great! Thanks for the heads up, Joshua. You’re welcome Tom. Sounds like you were definitely planning ahead with those nib purchases. It’s getting tougher and tougher to find a lot of those and the prices are getting more expensive when you do find one. How different is the B and BB nib of the M800/M805 in terms of line width? If you have writing samples, that would be very helpful. Thank you. Hello. I personally prefer finer lines but have had experience with all of Pelikan’s nib widths. The broad nibs are just that, maybe made even more so by Pelikan’s generous ink feeds. Of course, a lot of line width depends on ink, paper type, and writing pressure. I do see a difference between broad and double broad all things being equal but it is not a huge difference. I don’t believe that I have any writing examples available from M8xx nibs. Double broad nibs aren’t currently in regular production so if you want one, you will have to find an older production nib.